Pierate - Pie Reviews: Would I show contempt to The Old Contemptibles Steak pie? Would I show contempt to The Old Contemptibles Steak pie? With the grand occasion of James’ birthday to celebrate at The Old Contemptibles in central Birmingham, part of the Nicholson’s Pub range, it was a pie-leasure to see a hearty pie selection to choose from at the pub. The pie, sold as steak and ale in a shortcrust pastry case with creamy mashed potato and sautéed greens for £10.95, was slightly more expensive than the other pies on the menu, but it made sense with it being a steak pie in comparison to chicken and a vegetarian pie offering. 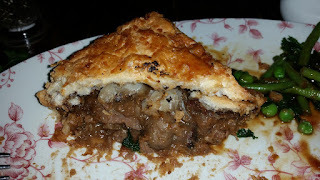 What caught my eye – and no doubt would catch some of yours – is that it was listed under the banner of “perfect pies”. Now, you know us. We’ve rated over 500 pies now on the Pierate Ship and so for anyone to call their pies perfect is a big boast which we were certainly wanting to test. So how did the Nicholson’s pie rate? Could it be our first 7/7 pie? And what difference would the Nicholson’s Pale Ale make? Well the first encouragement was that it was a nice, big fully encased pie being presented to me. The gravy was in its own gravy boat – thus ensuring that the gravy didn’t make the pie have a soggy bottom – and the pie looked nice and golden. Sure, it could have had a bit more of an even glaze (and for piefection I would expect this) but condition and colour would score well. The pie held together well when cutting and revealed a solid, if not spectacular, capacity of filling. 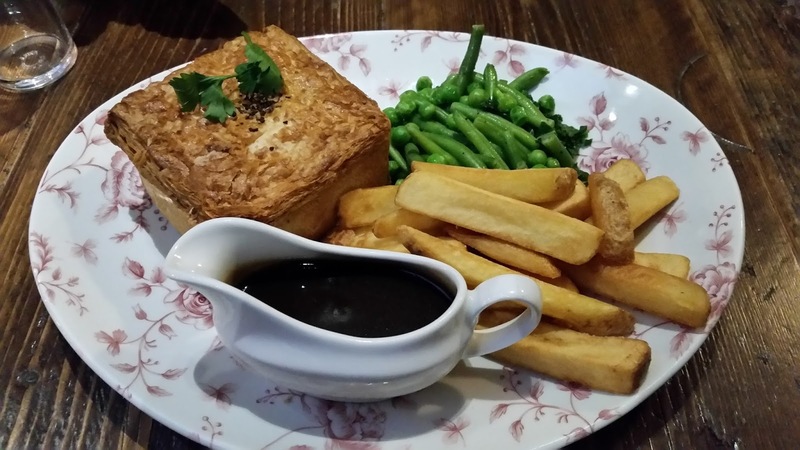 There was a decent amount of steak and the gravy was very flavoursome and added to the appeal of the pie, however there was a fair bit of filler too in the nice ale gravy. All in all the pie tasted good and was enjoyed, but the pastry:filling ratio certainly wasn’t perfect. Reflecting on this I think it is due to the square shape, which looked aesthetically pleasing but does give a lot of pastry and more than a similar sized circular pie (even if the square pie in theory could hold a little more filling too).